From deep within my drawers comes this ancient doodle. It was an attempt to depict the characters of Squiggle and Curly Mark, a duo that my friend Gareth and I came up with amidst the endless amounts of other nonsense we were always inventing. 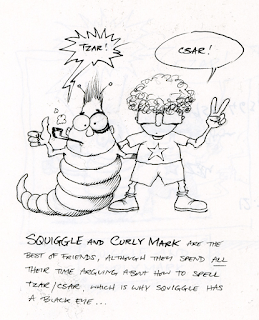 Having consulted the dictionary for the definition of the word 'squiggle' for some reason that I forget, we found that it was described as 'a curly mark', and so this pair were born. I present them here, because in some ways they're an early precursor to Edgar and Jarvis in The Octopuppy.